Wallpaper offers a fast, easy and inexpensive way to decorate plain walls. Whether it’s the bathroom, bedroom, living room or practically anywhere else inside the home, you can always resort to wallpaper for a convenient solution to the wall decor. However, one of the disadvantages of using it is the simple fact that the glue tends to meld into the wall over times. When you finally get ready to remove your old wallpaper and replace it with paint, you may find yourself struggling to pull it off. 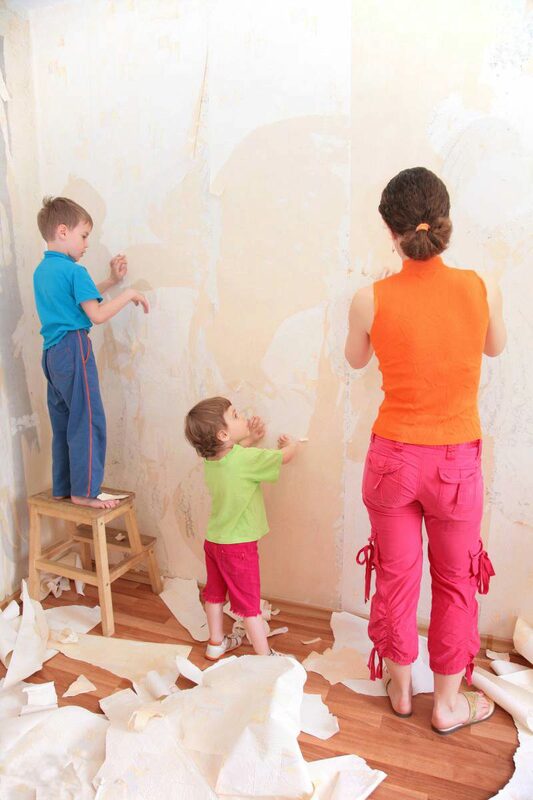 So, what’s the easiest way to remove old wallpaper inside your home? The first step in removing wallpaper is to prepare the walls. Make sure all of your furniture and furnishings are moved out of the room and the floor is covered with either a painter’s tarp or drop cloth. To make the process easier, you should run a scoring tool against the surface of the wallpaper. Scoring tools are small handheld objects with ridges that penetrate the wallpaper; you can purchase them from most home improvement stores for a couple bucks a piece. With your wallpaper scored, you should then spray a removal solution on it to help deactivate the glue. Again, you can find wallpaper removal solution available for sale at your local home improvement store. Alternatively, a solution of half warm water and half distilled vinegar also works. Spraying this solution over your newly scored wallpaper allows it to seep down between the paper and the wall; thus, deactivating the glue. Whether you sprayed the wallpaper with a removal product or just used vinegar, you should allow it to sit for 10-15 minute. Once this time has passed, use a wallpaper scraper to begin the removal process. Ideally, you should be able to scrape a portion of the wallpaper off and peel back the rest. Start from the bottom and peel up once you’ve uncovered a section of the wallpaper. Continue doing this until the majority of your wallpaper is removed. You can then go back with the scrape to remove small portions that remain stuck to the walls. Now that your wallpaper is removed, you can clean up the mess that’s left behind (trust me, there will be plenty of it). Assuming you followed the steps listed above and covered the floors with a drop cloth, cleanup should be a breeze.